American Ninja Warrior, NBC’s obstacle course competition airs tonight with an all Monday, June 20 season 8 episode 4 called “Oklahoma City Qualifier.,” and we’ve got your American Ninja Warrior recap down below! On tonight’s episode in Oklahoma City, obstacles include the Floating Steps, Ring Swing and Rock ‘n’ Roll. On the last episode, “American Ninja Warrior” traveled to Indianapolis, Indiana where competitors tackled six obstacles including the brand new Floating Steps, Fly Wheels and Disk Runner. Did you watch last week’s episode? If you missed it we have a full and detailed American Ninja Warrior recap, right here for you. 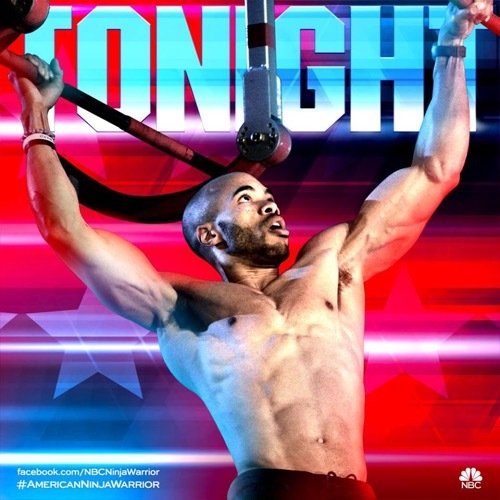 Tonight’s episode looks like it is going to be great and you won’t want to miss it, so be sure to tune in for our coverage of NBC’s American Ninja Warrior recap at 8:00 PM EST! While you wait for our recap hit the comments and let us know how excited you are about the show so far. #AmericanNinjaWarrior is in Oklahoma City tonight. Akbar and Matt are on hand at the course which is in sight of the capitol building. Tonight Mighty Kacy is running the course and so is Lance Pekus plus top rookie from last year Daniel Gil. The course has three new obstacles. The floating steps are tougher this season, then there’s the new Ring Swing, the Log Runner is an old favorite. The Tire Swing is next – the Bar Hop is new and is almost like a horizontal salmon ladder. Then there’s the taller Warped Wall. First up tonight is Michael Ray Garvin who is a former NFL player who is jacked and fast. His photo went viral as “the world’s most jacked athlete” – he’s both strong and nimble. He hops the steps easily then struggles on the dismount but makes it. Now he’s onto the new Ring Swing and finally catches it on the hook. Garvin doesn’t have a lot of obstacle experience and then falls off on the dismount. He released too soon on the swing and got pulled back into the water. Next up is an Air Force tanker pilot who goes by the name Major Doom. He clears the first two steps and this 39 year old dad of three is killing as he surpasses the Ring Swing. He tips up on the log runner and fights til the end. He stayed dry and moves on to the Tire Swing but falls hard off the Bar Hop. On the break, three more ran. Rookies Marc Coulam brought his pet turtle but went off on the Ring Swing. Bill Domke brought his dog but then bit it on the Log Runner. Elliot Jolivette had tons of cheerleaders but went down on the logs as well. Next up is Matt Stringer and the dad of six daughters stays busy at home – all his kids are younger than 12. The dad hops the steps with a little struggle but he gets past them and then faces the Ring Swing. This dad used to be out of shape a year ago, but has turned himself into a strong man. He hops the Log Runner with little difficulty and now it’s the Tire Swing. He can’t make the transition to the third tire and takes a tumble. Three ran on the break. Eric Amadi Wright wore a floatie but fell on the Ring Sing. Amanda Smith made it to the Log Runner but then took a spill. Flip White Jr from the Harlem Globetrotters fell at the Tire Swing and went down hard. Nate Burkhalter is next and he does volunteer work in third world countries to dig wells. The walk-on has stood in line two years in a row and now gets to run. He makes it past the Steps, then moves to the Ring Jump. He clears that and runs the logs and moves to the Tire Swing. He clears that too and now it’s the Bar Hop. He nails that one too and now it’s just the Warped Wall. He grabs it and slaps the buzzer at 2:48:61 to be the first finisher of the night. He says it’s been three long years but nothing is better. Next is Allison Topperwein and she’s got Parkinson’s Disease but is determined to run the course. The single mom is determined not to let her story end this way. She started training to be a Ninja Warrior because exercise slows the progression of the disease. She starts and takes the steps. Akbar says his father has Parkinson’s too and so did his hero Muhammad Ali. She struggles on the last step and then to make the dismount. She keeps slipping and doesn’t seem like she’s going to make it. She drops and the crowd cheers for her. Next is Brian Burkhardt who wants to be class president of his law school and hopes being a Ninja will help. He runs the first several obstacles but struggles on the Tire Swing and spins around dizzily. He presses on but falls out on the dismount. On the break, Kevin Klein is a Vegas finals runner but was taken out on the Log Runner. Kevin Jordan took a bad spill off the Tire Swing. Jessell Boseman was taken out by the Bar Hop. Next up is Brian Beckstrand from Utah who built a backyard Ninja course for his family. He says the whole family is obsessed with the show and his son wanted a Ninja Warrior birthday party so he started building obstacles and didn’t stop. He says they have over 40 obstacles in their yard including three warped walls. The dad hustles past the steps and now is on the Ring Swing. He lands easily and moves to the Log Runner which he jogs past rapidly. Now he’s on the Tire Swing and lands that too. Now he’s onto the Bar Hop. He clears that too and now it’s the Warped Wall. The Utah dad hits the buzzer at 2:35:96 to be the second finisher of the night and takes the fastest time so far. Adima Cope is next and is running for his son. The IT guy is dedicating his run to his son who has spina bifida and says he was told his son would never walk. Adima takes on the steps and does well then moves past the rings with a hard tumble. He makes it past the Log Runner too and now is on the Tires. He struggles on the transition and the tire takes him out because of the narrow grip on the last one. Next up is the #CowboyNinja Lance Pekus – he’s also competing on Spartan: Ultimate Team this year. We see a look at him doing some work for the Forest Service and he uses his ninja skills and it’s adventurous. He says he gets stuff others can’t reach. He runs the steps like they’re nothing then pulls off his hat to take the Rings. He passes that obstacle and then takes a shocking tumble off the Log Runner. He takes a hard hit on the last log and is in the drink. He just had a misstep and then says he didn’t hit it fast enough. Next is Artis Thompson III who is an amputee that lost his leg three years ago. His little brother died in a motorcycle accident too and says he missed his guidance then gained some perspective after he lost his leg. He says now he has purpose. ATIII made it to the third obstacle last year. He struggles a bit with the Steps. He struggles with the dismount but finally makes it. Now it’s on to the Ring Swing. He makes it past that and now it’s the Log Runner. He gets stuck on the third log and falls down. He tries to move on and balances and he moves up another log. He makes the next one too and the crowd goes nuts. He’s on the last one and has his hands on the platform. He made it! The crowd is on their feet and cheering. Now he’s on the Tire Swing but must be tired. He almost makes the dismount but tumbles in and hits his head. The crowd cheers like crazy and he’s got a standing ovation all around. He’s the POM Wonderful Run of the Night. On the break, three more Ninjas ran the course. Kim Proctor waited 12 days in walk on but went out on the log runner. Grant Clinton had a stroke six months ago but made it all the way to the Tire Swing. Cass Clawson is a parking valet who finished the course with a very fast time. Next up is Jon Stewart who is 54 and running hard with all five of his kids there cheering. He’s the oldest guy to make it up the Warped Wall. He’s on the Tire Swing and gets caught up. He makes it though and moves to the Bar Hop. Jon clears that, runs the wall and it’s at 3:18:67 because he forgot to hit it the buzzer til Matt and Akbar reminded him. He made history again and broke his own record. He says he loves this course. Next up is Scott Stoddard who has a sword and a shark in his hands. He’s a stuntman and animator and does camera capture for motions on the characters in games he helps design. He runs the Steps and heads for the Rings. He’s moving well. Now it’s the log runner which takes him out after his foot slips off. Spartan racer Rose Wetzle was taken out on the Log Runner. Veteran Andrew Lowes takes a selfie at the buzzer. Karsten Williams made his mama proud – she was there cheering as he slapped the buzzer. Next up is Sam Sann, the gym owner that trains Ninjas. He’s 49 and looking for more success. A lot of his training partners are there to watch. He’s made it to Vegas the last three years. He hops the Steps, takes the Rings and moves to the Log Runner. He hops along and then nearly falls on the last one and struggles but finishes it. Sam moves to the Tire Swing and does well but falls on the dismount on the fourth obstacle. His grip was off and the tire had a cap where he reached. The crowd can’t believe it and neither can the crowd. Kyle Mendoza is next and he’s a Parkour internet sensation. Kyle goes past the Steps and Rings fast then moves to the Log Runner and hops it easily. Now he’s on the Tire Swing and kills that one too. The Bar Hop is no problem and he’s off and ready to run the wall. He flips over at the end and then slaps the buzzer at 2:23:82 which is the fastest run of the night. Ninja veteran Brent Steffensen is next. He and Kacy were the royal couple of the Ninja Warrior crowd and will both run tonight but they have broken up. He says the break up was hard on them and says for three years they were together 24/7. They still work together and train together a lot. She says she’ll be there cheering him on tonight. She’s with his dad on the sidelines. Brent hops the steps, dismounts and makes quick work of the Rings. He hops right past the Log Runner and Kacy cheers. Now Brent is on the Tire Swing and makes it past then goes for the Bar Hop. Kacy is stunned when the Bar Hop takes him down. The bar spun and he lost his grip and then got soaked in the water. He says he’s not a switch grip guy and says he should have gone with his gut. Kacy Catanzaro will run the course next. Mighty Kacy hopes to rebound after a tough fall last year. Kacy starts on the Steps with Brent at the sidelines cheering her on. She lands and moves to the Rings. She lands that too and now it’s the Log Runner. She takes her time but slips, struggles and then falls. Both Kacy and Brent went out far sooner than anyone expected. Matt and Akbar agree that this course is a tough one. Kacy says she was excited to get there but was nervous and wanted to be light and quick and she messed up before she realized it. Three more ran on the break Tim Wood fell hard on Log Runner. Tremayne Dortch ran all the way to the wall and it the buzzer for the fifth year in a row. David Campbell also ran the wall and the eight-time veteran had the fastest run so far. Thomas Stillings runs now and he’s a Texas Parkour instructor. He’s second year veteran and made it to Stage Two last year. He runs through the first four obstacles and faces the Bar Hop now and is flying. He runs the wall and slaps the buzzer at 1:43:51 to steal the fastest time of the night. The last run of the night is Daniel Gil. Last year, Daniel had the fastest time of the night as a rookie. He’s now part of a professional dance company and thinks it will help him on the course with balance and coordination. Sam Sann, his mentor is there watching too. Daniel is moving fast on the course. The first three obstacles whip by in little more than 30 seconds then he’s on the Tire Swing. He finishes the Bar Hop at 1”38 amd rims He slaps at 1:44:17 and misses the fastest time by less than half a second. There were 15 finishers and Brent Steffensen will move on since he made it most of hte way through the course.